Using 5.00mm hook ch27, sl st to first ch to make a ring. Change to 4.00mm hook, ch1, (RS) 1sc in base of ch1, 1sc in each ch to end, sl st to first sc on beginning row (27sc). Turn. Next row – ch1, 1sc in base of ch1, 1sc in each of next 8sc. Turn. Row 2 – ch1, 1sc in base of ch1, 1sc in each sc to end, sl st to first sc. Turn. 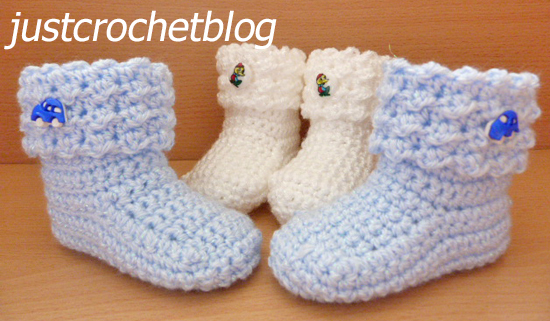 With WS of bootie facing, ch1, sl st loosely through centre loops of the sc’s to close gap on sole of bootie. Fasten off. Pattern Row 2 – ch1, sl st in base of ch1, * 1dc, in next hdc, sl st in next hdc, * rpt from * to * to last hdc, 1dc in hdc, sl st to first sl st on beginning of row. Turn. 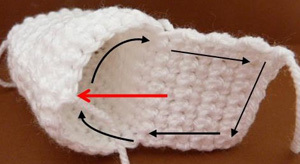 Turn through to RS, fold cuff over onto RS (from where you worked in front loop), attach a button to side of cuff on each bootie. 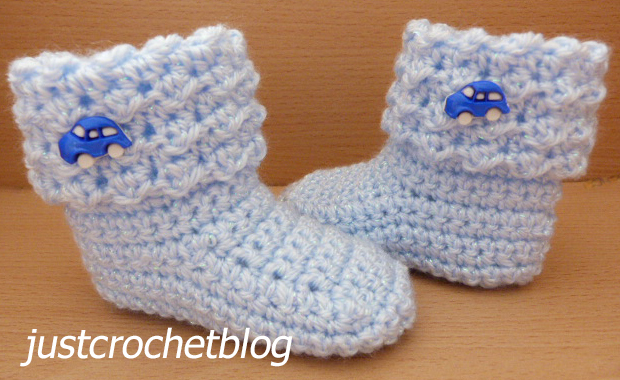 Hope you enjoy this free crochet baby glitz booties pattern, don’t forget to pin!